Mucho Macho Man gave Gary Stevens his first Breeders' Cup Classic victory at Santa Anita Park on Saturday, just holding off 3-year-old Will Take Charge by a nose after a thrilling stretch run before a crowd of 58,795. Stevens, a 50-year-old Hall of Fame rider, came out of retirement earlier this year and was riding in the Classic for the 15th time. He is the only jockey to ride in the first Breeders' Cup at Hollywood Park in 1984 and the 30th this year. European Declaration of War was a head behind Will Take Charge in third, with 2012 Classic winner Fort Larned fourth, 3 1/4 lengths farther back, and Last Gunfighter fifth in the mile and a quarter contest clocked in 2:00.72. Palace Malice was sixth, followed by Paynter and Flat Out. Favored Game On Dude, who was in the driver's seat in the Horse of the Year picture after winning his previous five races this year, bid for the lead with five-sixteenths of a mile to run but faded badly in the final quarter mile to be ninth, well beaten as the favorite for the second consecutive year. Moreno tired to be ninth and Planteur was last of the 11 runners. Ron the Greek was scratched from the race because of a quarter crack. Mucho Macho Man, a Florida-bred 5-year-old by Macho Uno out of Ponche de Leona, by Ponche, finished second to Fort Larned in last year's Classic under another Hall of Fame jockey, Mike Smith, who was aboard Game On Dude in this year's Classic. Moreno battled for the early lead with Fort Larned, going the opening quarter mile in :23.39 and the half in :46.36. Game On Dude was in close pursuit in third, with Mucho Macho Man fourth on the outside in the run down the backstretch and Declaration of War fifth. Six furlongs was clocked in 1:10.23. Fort Larned took the lead briefly after reaching the far turn, but Stevens confidently Guided Mucho Macho Man to the front with a three-wide move, the mile fraction timed in 1:34.84. Declaration of War, making his first start on dirt for Irish trainer Aidan O'Brien, tried to make a race of it under the trainer's son, Joseph, but Stevens and Mucho Macho Man got the jump on them. Victory for Stevens and Mucho Macho Man seemed assured, but in the final yards Luis Saez had Will Take Charge in full flight on the outside and just missed. “I really thought he got us – it was scary,” Dean Reeves said afterwards. Kathy Ritvo trains the Classic winner for Reeves Thoroughbred Racing, the racing stable of of Dean and Patti Reeves of Atlanta, Ga. Mucho Macho Man was bred by John and Carole Rio of Ocala, Fla. The outcome tilts the Horse of the Year picture toward the reigning champion, Wise Dan, who successfully defended his title in the Mile and is six for seven on the year, all of the wins on turf and three in G1 races. A victory by Game On Dude would likely have given him the title. Disappointing races by Royal Delta and Princess of Sylmar in the Distaff on Friday ended any outside hopes they had. Likewise for 3-year-olds Palace Malice and Will Take Charge, though the latter's strong second-place effort likely sewed up his title as champion 3-year-old male. 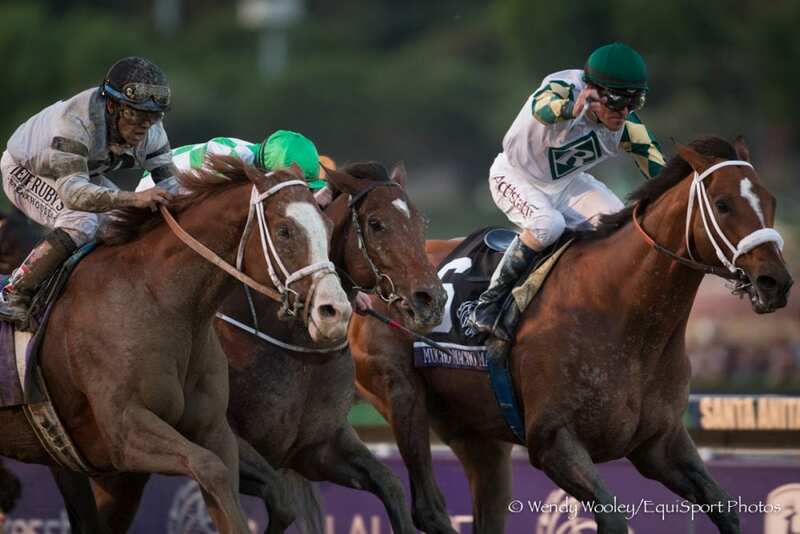 Mucho Macho Man won only one previous race this year – the G1 Awesome Again at Santa Anita in late September. He's eight for 23 lifetime and two for five this year. Is that enough to dethrone Wise Dan? Chad Brown (trainer, Last Gunfighter, 5th) – “He ran great. I think that's about as good as he can run and Javier rode him well. Our plan was to sit back and let them mix it up early. We thought there would be a strong pace, and it was, then come late to get a piece of it. We weren't far off from getting fourth, really. Fifth place is respectable. I'm proud of my horse. We'll regroup for next year. This entry was posted in Breeders' Cup and tagged Breeders' Cup, breeders' cup classic, Gary Stevens, Horse Racing, kathy ritvo, Mucho Macho Man, Paulick Report, Will Take Charge by Ray Paulick. Bookmark the permalink.